I’m a shoe girl. I love new shoes, strange shoes, sparkly shoes, shiny shoes, high-heels, and pink shoes. Every time I do that whole closet clean-out thing where I de-clutter and get rid of some shoes it only opens up space for more shoes to accumulate. I am not so much a purse girl. I know people who collect both shoes and purses, but it often seems that people have more of a love for one than for the other. I tend to go more to the lazy practical side as far as purses go. I have several in a stash that I could switch out if I wanted to, and sometimes do if I have a good reason, but most often I just carry the same one around until it wears out, then I replace it with a new one and start the cycle over. Purses for me are firstly and mostly a way to carry the necessary stuff with me (currently that includes a spare diaper or two for the youngest, so skipping a purse or using anything small from the purse stash is out). 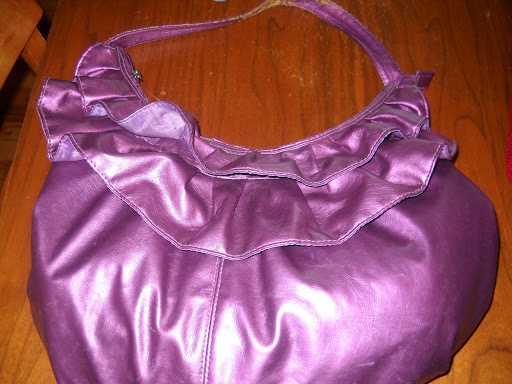 Of course, being the girly-girl that I am, I tend to prefer interesting purses with sparkles, ruffles, or odd colors, even as my go-to every-day purse (so much for being all practical about purses). 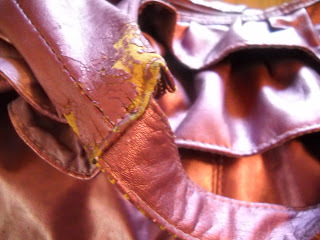 Yes, this probably makes me mis-matched at times, but I’d rather have a mis-matched purse than a boring one. I bring this up now, because the most recent every-day purse I had bought was wearing out. You’re right, it doesn’t look that bad, until you get a closer look. Whatever that shiny purple coating is made from is shedding its purpleness. Also, the zipper is breaking and I’m starting to wonder as I’m carrying it around whether it’s going to do that thing that worn-out purses do and suddenly let loose one side of the strap. It was time for a new one. So I started looking. And looking, and looking. I just wasn’t feeling love for anything I was seeing in any store I went to. Its been a long-drawn out search over the past couple of months. Every time I went into a different store I’d wander into the purse area to see what was there. I toyed with the idea of making myself one, but I think this is really where I show my lack of zest over purses. I just am not interested enough in making one to actually go to the trouble to pick out fabric and sew something up. It isn’t that I don’t think I could manage the skills for it. It just doesn’t excite me, at least not enough to spend my limited sewing time on it. However, the need to replace my purse (which is probably about a year and a half old) was starting to move up my priority list, and I still wasn’t finding anything. I started looking on Etsy where there are definitely plenty of passionate purse people to be found. I avoided looking for vintage purses. I don’t know enough about them to know whether I was getting something good for the price, and don’t want anything that I’m going to have guilt over using it in real-life (if it lasted 50+ years, what right do I have to shorten its life now?). I didn’t have any pre-conceived idea of what I wanted, but I had a feeling that when I found it I would know that it was the right thing. Then I found this cute little shop. This is exactly what I was looking for. My new soul-mate until it wears out. Given the burlap and canvas materials it is made from, it might be a very long-term relationship, and I’m OK with that because I just love it that much. To make it even better, the packaging it came in looked just like a present to myself, all wrapped in pink tissue paper and tied with a bow. Personally, in case you hadn’t noticed, I’m really happy with this purchase. The hand-madeness of it, though, makes me wonder if I’m going to get questioned whether I made it myself, especially by people who know that I sew. Of course, I’ll come clean and tell them where I got it if they want to know. I have a feeling that not everyone will understand this, but I think anyone out there who sews will see where I’m coming from when I say that just because I have the skill set to make something, doesn’t mean that I will always make everything. Also, when it is something so cute and different from a small shop, I don’t feel right just copying what is being offered. Since this is exactly what I wanted, I didn’t see any way for me to make it more “me” by making it myself, so it would have felt like cheating the seller to take her idea and run with it. In closing: Would you agree that it would have been morally wrong to take her idea of red burlap and striped canvas and make my own exactly like the one I ended up buying? While I wouldn’t have actually profited from selling said self-made item, it would have been one less she’d sold if I copied and made my own. On the other hand, I do understand that ready-to-wear or elements/items from ready-to-wear outfits are copied all the time. Is it different when the “ready-to-wear” is the product of a small shop rather than a “corporate machine”? If the seller is offering a pattern in addition to hand-made items (the way Ohhh Lulu has done in the past), does that change things? I have a purse that I ordered from "The Ruffled Daisy" you have featured here and it is my go-to purse for every season!!! It's very well made and the design (a draw-string bag) is just so cute!! I would highly recommend her stuff!! 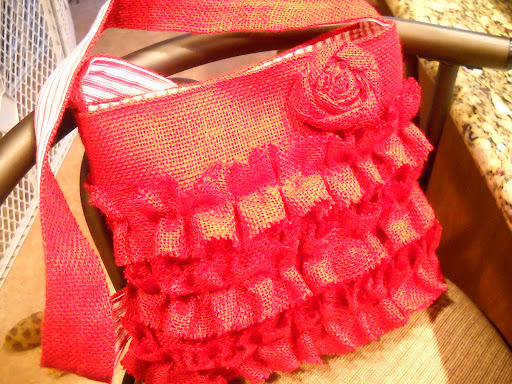 It's a very cute bag, and the idea of supporting another handcrafting business is good 🙂 I don't make my own bags either, but I buy very high quality and spend a lot on each one.